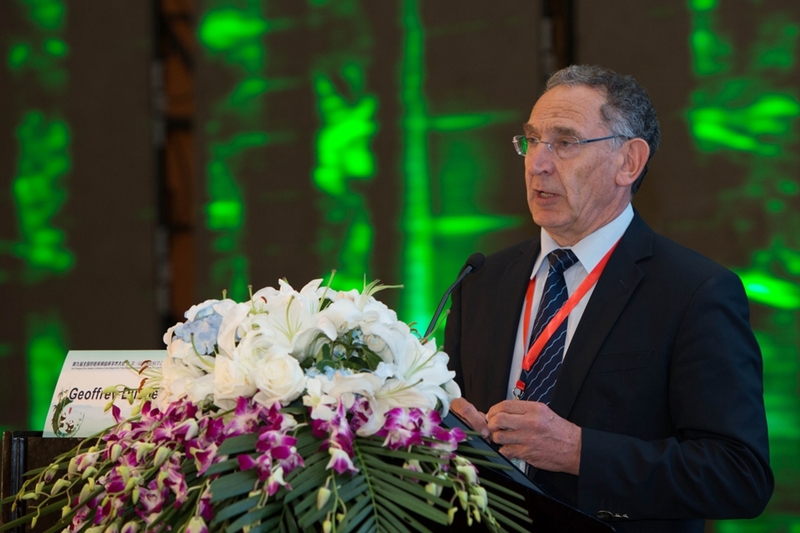 Prof. Dusheiko presenting EASL recommendations for viral hepatitis B in Cheungdu, China in 2014. Imagine a treatment for chronic viral hepatitis. Imagine the eradication of the virus. Imagine a cure for primary liver cancer. These are his most passionate dreams and visions. After devoting 40 years of his life to research in hepatology, the doctor’s enthusiasm remains strong as ever. Now an emeritus professor of medicine at the Royal Free Hospital, Kings College Hospital and University College School of Medicine in London, Geoffrey Dusheiko looks back at his odyssey towards the elimination of liver diseases. Born in 1948 in South Africa, he spent the first 40 years of his life there. In his homeland, he witnessed significant morbidity caused by hepatitis B & C so he decided to take on the problem as a personal challenge and began a relentless pursuit of an effective treatment for chronic viral hepatitis. Scope recently sat down with Professor Dusheiko in Hong Kong. He recounted interesting episodes of his career as a hepatologist and gave advice to young investigators considering a research career. Why did you choose hepatology as a speciality? Dusheiko: When I was a young medical student and young registered resident in training, I encountered many young men and young women presenting with advanced stages of primary liver cancer, due to chronic hepatitis B infection. I was deeply saddened to see these patients dying so early in life. So I decided to make a contribution to defeating chronic hepatitis and primary liver cancer. I took it up as a personal challenge to try to develop a treatment for chronic hepatitis B. Also, I was interested in pursuing a research career and then pursuing the science of hepatology, viral hepatitis seemed an obvious area of research. What major challenge and encouragement did you face when you first started your medical/research career? Dusheiko: I met both challenges and encouragement. My Head of Department at the time thought there was not enough scope in research in viral hepatitis but in retrospect, he was wrong. We have collectively reached important milestones in the therapy. I tried to understand the epidemiology, the molecular virology and the biology of the virus but also concentrated on the therapy of chronic hepatitis B. Looking back, I was very fortunate because I was one of the first people to experiment with recombinant interferon alpha. Roche had developed an injectable recombinant interferon and introduced it as a treatment for various cancers. They visited my mentor, Mike Kew and myself and asked us to do a trial of alpha interferon in primary liver cancer. Given that it was an antiviral agent, we thought it was worthwhile to do a trial in chronic hepatitis B. We treated approximately 30 patients. Some of them responded positively to the drug, losing the so called e-antigen (HBeAg) and some, even surface antigen (HBsAg). That set the stage for further research and development. That must have been an exciting moment for you! At that time, interferon had not been proven useful and it had so many side effects. You were very brave to be one of the first to try such a difficult drug! Dusheiko: I wasn’t brave. The patients were the courageous ones. We treated the first patient with a high dosage of interferon alpha (that we inherited from the oncologists who were using interferons to treat liver cancer). They were using very high dosages —50 million units- by subcutaneous injection daily.I still remember the name of the first patient in the trial to this day). She was a young surgeon who worked in a clinic in Johannesburg, where she had unfortunately accidentally had a needlestick injury and developed severe chronic hepatitis B. It’s somewhat unusual for an adult and for a female to have chronic hepatitis B, but typically she had not presented with jaundice during the acute illness. She accepted treatment and suffered enormous side effects. 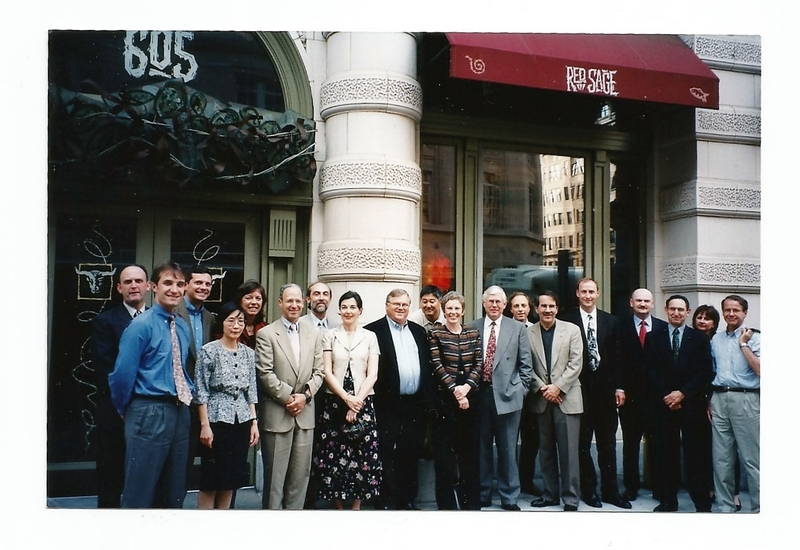 Prof. Dusheiko, his Faculty and friends at the Scientific Advisory board of viral hepatitis pose with renowned international figures in the field of viral hepatitis, USA. Imagine that! 50 million units per day! Dusheiko: That’s why I say the patients were brave! The young surgeon was treated in hospital for the first week. Despite many adverse effects of the interferon, she sustained the course of therapy and lost HBeAg and subsequently HBsAg. That really encouraged me so we began a wider treatment programme and treated a number of patients who consequently lost HBsAg. Most of the patients showed a definite sequence of a flare up of their hepatitis B during treatment, but went on to be cured. This early success was instrumental for me to go on, despite the fact that many patients experienced shocking side effects (including one with a brain abscess) probably associated with the use of interferon and neutropenia (a low white cell count). Had it been a negative study with such adverse side effects, it would have been discouraging. But the fact that I saw the pattern of seroconversion was highly encouraging. It encouraged everyone in the unit and marked one of the most defining moments of my early career. So having a bit of beginner’s luck can make a world of difference! But still, the fact remains that interferon is a difficult treatment method. How did you encourage patients who experienced severe side effects to go on? Dusheiko: Indeed, patients who were treated in the early days found it extremely difficult. Several of them could not persist with interferon after the first week or so. Often, it’s those who had the most demanding occupations like computer programmers, heads of companies that had most difficulties with interferon because it inhibited their ability to work. As a doctor, I find that you have to remain empathetic because empathy is as critical as knowledge and clinical analysis. Patients were however reassured and motivated by the results. It gets very dispiriting if you don’t see results. You learn to reach stopping points, to minimize harm and unnecessary and even futile treatments but you can encourage patients with results without giving them false hopes. I also find that building a good relationship with patients is important. I think of the relationship between physician and patient as a partnership. Using difficult drugs which do not have a guarantee of success requires a connection with patients. How do you build a partnership with patients? Dusheiko: You have to be on the same wavelength as your patients. Put yourself in their shoes and empathize with them because they do trust you. Fortunately, my experience working in South Africa, America, and Europe gave me a lot of exposure to patients from various backgrounds so I could identify with patients with many diverse cultural and social backgrounds. This helped me succeed in building trust and an appropriate asociation with my patients and research participants. Besides empathy, what other qualities are important in a researcher/doctor? Dusheiko: Curiosity, determination, and persistence. These two are the qualities that kept me going in my career. Can you tell us an episode when you have demonstrated all these qualities? Dusheiko: When I was a registrar, I encountered a young woman with episodic severe vomiting, hypoglycaemia and a metabolic acidosis without ketosis. She lost two younger siblings who also had died with jaundice, vomiting and hypoglycaemic coma. I was very curious to find out the possible causes so I searched different sources of literature. I read of a syndrome of vomiting, hypoglycaemia and severe metabolic acidosis associated with the eating of unripe ackee—a fruit grown in which is a staple of the diet in Jamaica. Consumption of unripe ackee can lead to a potentially fatal toxicity known as Jamaican vomiting sickness. The unripe fruit contains a toxin called hypoglycin which inhibits oxidation of long chain fatty acids and active gluconeogenesis. The inhibition of enzymes of fatty acid oxidation leads to accumulation of several organic acids. I said to my professors at the time that I thought the patient had an inherited illness that most resembled Jamaican vomiting sickness! Of course since South Africa is a long way from the West Indies, the idea seemed risible, and the suggestion provoked laughter. I did not let that discourage me, however, and, once they saw I was serious, indeed Professor Michael Kew and Tom Bothwell both gave me free reign to pursue the idea. I wrote to a hepatologist in Boston (Ray Koff) who suggested that I contact Kay Tanaka, a scientist and geneticist at Yale University. He was a pioneer in the use of gas liquid chromatography in the identification of inherited metabolic disorders of fatty acid oxidatoin. I asked Kay Tanaka for advice, and if he could measure organic acids in this patient because I felt that there might be a defect of mitochondrial beta-oxidation. I shipped urine, blood and skin fibroblast samples to him. The results showed greatly increased quantities of glutaric acid, and several other organic acids consistently in her urine. The ability of cultured skin fibroblasts from the patient to oxidize [1(-14)C]butyrate and [2(-14)C]lysine was reduced. These urinary and in vitro findings indicated markedly defective activity of several acyl coenzyme A dehydrogenases, including glutaryl, isovaleryl, and butyryl coenzyme A dehydrogenases -- establishing a diagnosis of glutaric aciduria Type II, an autosomally recessive inherited disorder of fatty acid metabolism. The neonatal form is usually fatal but the adult form with late onset is intermittent and evident during periods of illness or catabolic stress. The paper was accepted in the New England Journal of Medicine, with an accompanying editorial which was very exciting for me as a young registrar in training. Of course understanding the pathogenesis of the disease (and it similarity to the acquired syndrome Jamaican vomiting sickness - also greatly assisted us in the clinical management of the patient as she presented with further life threatening episodes of the illness. This was another defining moment of my career, which greatly encouraged me. I could see the potential of realizing scientific dreams, but also the necessity for knowledge to understand and manage disease, and how scientific curiosity in the face of criticism and skepticism is necessary to obtain the truth. This was done because your curiosity and persistence. Dusheiko: Yes, it’s important to stick to your guns and never give up your curiosity. Determination kept me going. At the same time, maintaining objectivity about your own data is as crucial as being determined. What I mean is that you shouldn’t “fall in love with your data” to the extent that you could be blind to the possibility that your data is incorrect. 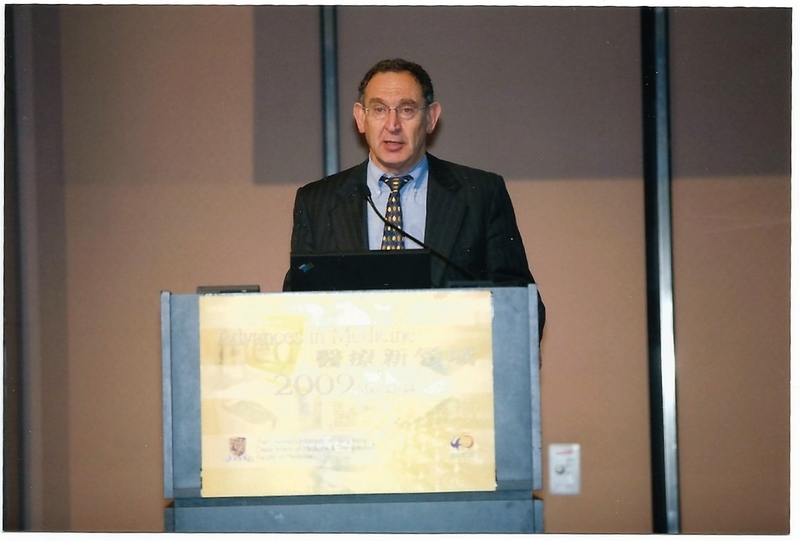 Prof. Dusheiko presenting at Advances in Medicine meeting in Hong Kong, 2009. This is wise advice. What other advice do you have for young investigators? Dusheiko: For young individuals considering a research career, I encourage them to travel and undertake fellowships in other units; one can only get so much from one unit and it is important to broaden your horizon. I learned incrementally from my sojourns at the National Institutes of Health in the USA and later at the University of Minnesota . I also encourage young investigators to find great intellects who could point them in the righ directions. You can never overlook the importance of an older and wiser mentor. Once you find the best people you can work with, don’t be afraid to ask or challenge. Don’t be affected by the “big name syndrome”. You don’t always have to agree with something just because somebody with a big name says it is so. If you come across with a diagnosis you disagree with, don’t be afraid to challenge the premise. But remember to do it politely and not belligerently! The best way to learn science and medicine is to talk to as many people as you can about a subject and ask questions. You can only get so much from the textbooks. Experts are usually willing to make time to answer young investigators’ questions because they are curious too and want to know what young brains are thinking and how they might be making the neural connections. Looking back at the beginning of your career, where did you think it was going to lead you? Dusheiko: Looking back at the past journey, when I was a young investigator, I didn’t know it was going to lead me very far. I thought that research would make an interesting career, that I would be active and if I was fortunate, it’d be enjoyable. Besides international recognition, what other rewards have you earned from your research career in hepatology? Dusheiko: I think the opportunity to travel, to broaden my horizon and to make a contribution to developing treatments for chronic hepatitis are the biggest rewards that I have earned. Early in my career as a research fellow, I travelled around Africa, Asia, America, and Europe so I had the exciting chance to rub shoulders with highly intelligent investigators and to be exposed to critical levels of science. I built on that and consider myself very fortunate. I am also grateful for the solid advice I had received from my mentors, including Michael Kew, Jay Hoofnagle, Sheila Sherlock and Neil McIntyre, all of whom possessed formidable intellects, and taught me different things. All gave me invaluable advice and guidance. Looking back, through my research, I have recognized the value of accurate and carefully conducted science. From clinical practice, I also received great satisfaction from one-on-one patient care. You have certainly made a significant contribution to the treatment and research of hepatitis. What is your outlook on liver diseases? Dusheiko: At this stage, my ability to have an impact on one on one care for chronic viral hepatitis is limited. What would make me really happy is to see improved world wide access to hepatitis diagnosis and treatment to widen scope for treatment in low and middle income countries or countries where the diseases are prevalent. In this way the late presentations I spoke of at the beginning of the interview would become a thing of the past. I think we are reaching our ways towards cures for hepatitis B, and look forward to witnessing these advances.